Christafari is a Christian reggae band formed in 1990. It is centered on the personality of ordained religious minister Mark “Tansoback” Mohr (born October 23, 1971), an American, born-again Christian. Until the age of 17, Mohr was a Rastafarian. The essential goal of Christafari is to promote Christianity to all people; including Rastafarians. In 1993 Mohr enrolled in Biola University and received his ordination in 1997. Their first album, Reggae Worship, reached the Billboard Charts and created a buzz in the industry, garnering the attention of DC Talk’s tobyMac who then signed the group to Gotee Records. Soulfire proved to be an early success for the fledgeling Gotee Records. 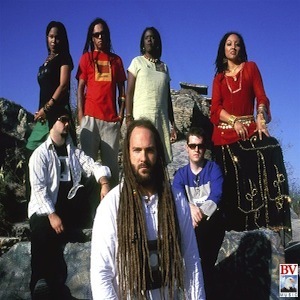 Valley Of Decision spent 15 weeks in the top 10 of Billboard’s “Top Reggae Albums” chart. The label began as a production company. Originally intending to produce Out of Eden’s Lovin’ the Day, they couldn’t find a label to sign the act to, and so began distributing the band’s material on their own. WordSound&Power marked Christafari’s departure from Gotee and the birth of Mohr’s Lion of Zion Entertainment record label. The album was nominated in four categories in the 2000 Caribbean Gospel Music Marlin Awards. They then released DubSound&Power, the bands’s first dub album and arguably the first Christian dub album ever recorded. After this the group released Palabra Sonido Y Poder (Word Sound & Power), the group’s Spanish debut that featured the single “El Amor De Mi Vida” (No. 1 in 11 Latin American Countries). After this they released Gravity (2003), Gravitational Dub (2004) and their first children’s album Reggae Sunday School (2005). 2007 Marked the release of Christafari’s To the Foundation and the birth of the Positive Music Agency. They toured 180 shows in 20 countries in promotion of To the Foundation. In early 2009 the group headed back into the studio to record their 20th anniversary album “No Compromise” with subsequent tours in Europe, Latin America and the USA. In late 2009 the band went back into their studio the “Zionic Sounds Dub Lab” to record their second Spanish album, Reggae De Redencion. This project was released in mid-2010. In late 2011 they released two dub albums; Majestic Heights in Dub and Dub Shots. They also released Gospel Reggae Praise, a compilation project. In 2012, Christafari released Reggae Worship: A Roots Revival, their first worship album in almost 20 years. This breakthrough album once again catapulted them onto the Billboard Charts. The CD debuted at No. 3 on the Billboard Reggae Chart, No. 10 on Billboards Christian Albums Chart and No. 39 on the Independent Albums Chart. Nearly nine months after this album was released, Christafari jumped to No. 1 on the Billboard Reggae Albums Chart. This marks the first time in Billboards history that a Christian artist has secured the top spot. The band was recently featured on ABC Family’s The 700 Club, and TBN filmed a live concert appearance in Hawaii for a special broadcast. They has also started their own film company, “Rank and File”, and filmed various music videos such as their “Try Jah Love”, “Taking in the Son/Brilla Sobre Mi”, Jennifer Howland’s “Righteous Revolution”, and three videos from Avion Blackman’s Third World Girl album. Over the past five years they has had a busy tour schedule. The band currently does around 100 shows a year in about 20 countries. Christafari’s lyrics are characterized by a heart for Rastafarians, a passion for reaching the drug-afflicted counter-culture and a distinctly evangelical Christian message. Two examples are the songs “Why You A-go Look?” (WordSound&Power) and “Teachings of His Majesty” (Reggae Redemption Songs II), which use the words of Haile Selassie I (former Emperor of Ethiopia) to challenge the veneration of this Christian king as Almighty God incarnate. Musically, the group fuses rustic roots with modern dancehall and yardee culture to create their own singature sound. Full of vibrant horns and rich female harmonies (by Avion Blackman and Jennifer Howland), the group has nine to ten members. In 1997 there was a division in the group that led to a split. Many of the members wanted to go mainstream in both sound and message, while Mohr refused to compromise the group’s authenticity of sound or their evangelical message just to sell a few more records. Mohr came out of the split releasing the landmark, “WordSound&Power” and launching Lion of Zion Entertainment. Erik Sundin and others formed Temple Yard. While Christafari continued with roots reggae and dancehall, Temple Yard was fusion oriented, showing pop, reggae, soul, and gospel influence similar to mainstream artists like UB40 or Big Mountain. Temple Yard released one CD on Gotee Records and then were dropped from the label and subsequently broke up. Through his ever-evolving band and various artist compilations, Mohr was arguably the first to record and internationally distribute the following subgenres of gospel music: reggae, dancehall, soca, me-reggae, jungle, raggamuffin hip-hop, dub and various other styles. Mohr has always placed the popularity of gospel reggae before his own band. He is the founder and president of GospelReggae.com, a webstore that boasts the largest selection of gospel reggae and world music in the world including artists like Papa San, Carlene Davis and Zema.